We're hearing this question a lot, particularly as physical and verbal attacks on racial and ethnic minorities, Muslims, Sikhs, and many others have spiked in the past week. 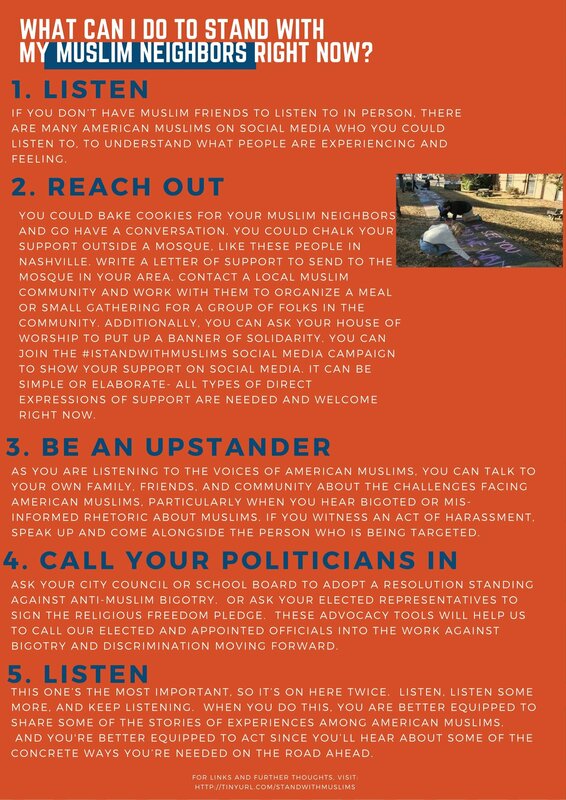 There are many answers to the question of HOW to stand with Muslims, and there will be many more ways to step up in the days ahead, but we have put together a few suggested places to start. Thank you, Global Ministries for posting this – for speaking the truth. As Muslims in our community are being threatened, our congregation’s Elders and broad membership are clear that our only response as followers of Jesus is to stand with and protect our Muslim neighbors. We do not just ‘hear’; we see and can testify to attacks and slurs against those who are latinx, black, Muslim in our community. As to Ms. Previte’s comment, the phrase “We’re hearing this question alot” in the first line of the Global Ministries post refers to "We’re hearing … the question “What can I do to stand with American Muslims right now?” The physical and verbal attacks are not hearsay; they are documented. I would like information on the attacks on minorities as you write in your column. Can you give examples of States where this happened and when? I personally watched a video of a man who had a Trump sticker on his car who was pulled out of his car and beaten by some black men. So, please, let your readers know the truth about the attacks on Muslims (“We’re hearing this question a lot, particularly as physical and verbal attacks on racial and ethnic minorities, Muslims, Sikhs, and many others have spiked in the past week”). You stated, “we’re hearing”. As a journalist, aren’t you supposed to write the truth and seek out what is true or not instead of “hearing” from other unconfirmed sources?